Today, the international MR-linac Consortium announced the launch of the MOMENTUM study. 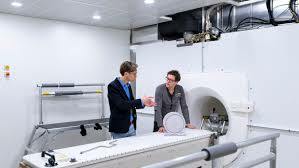 The study is designed to generate data that enable safe, fast and, above all, serves as an evidence-based introduction of magnetic resonance radiation therapy (MR/RT) into clinical practice. The MOMENTUM study represents the next step in the development of the Elekta Unity MR/RT system; the study will be focused on building a robust body of real-world clinical evidence and insights made possible by this technology. Information gained through the MOMENTUM study will guide the use of MR/RT to improve outcomes for cancer patients. “Each treatment session on this innovative system is an opportunity to gain insight into the benefits that this technology provides and, critically, to determine which patients benefit from MR/RT therapy,” said Dr. Helena Verkooijen, Professor of Evaluation of Innovation at University Medical Center Utrecht (UMCU) and a member of MOMENTUM’s Management team. Radiotherapy is an important component in many cancer treatment regimens and approximately 50% of all cancer patients receive radiation during their treatment journey1. As with most medical therapies for cancer, radiotherapy is associated with short- and long-term side effects that can be treatment-limiting and/or reduce patients’ quality of life during and after therapy. Many of these side effects result from radiation-related damage to healthy tissue. The MR-linac system is designed to address this challenge by allowing improved targeting of radiation to the tumor and reduced exposure of nearby tissues and organs. MR-linac Consortium launches MOMENTUM study to guide MR/RT, continue Elekta Unity progress. Appl Rad Oncol.